We offer various bacterial analytical services and tests at Mold & Bacteria Consulting Laboratories (MBL). We can test air samples (taken by an RCS sampler or an Anderson sampler), surface samples (taken by culture-swabs), and water samples, as well as many other types of samples. If you have a question regarding a particular test (including those not listed here), please feel free to contact MBL. Coliforms (purple) growing on differential media. Coliforms are tested for as indicators of sewage contamination. They can be tested for in water samples, swab samples, and air samples. Water samples (if the water comes from a chlorinated system) must be treated with sodium thiosulfate. Swab samples are collected using liquid culture swabs to preserve the sampled bacteria. 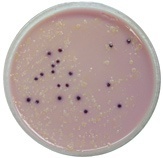 A basic test involves testing for presence/absence of coliforms with or without enumeration. A more detailed test involves identification of the coliforms to genus or species with or without enumeration. For sampling information, please contact us so that we can discuss the needs of your unique situation. Iron bacteria are seen as nuisances, and are particularly common in systems using wells as a water source. They produce thick slime layers, which can cause blockage in a plumbing system. Iron bacteria can also discolour water or cause unpleasant odors. Testing for iron bacteria involves determining the level of contamination per milliliter of water. 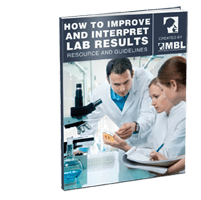 Results are reported as number of colony forming units per milliliter (CFU/ml) of water. For sampling equipment and information, please contact us. Sulfur bacteria act in a similar fashion to iron bacteria and are also commonly found in well-water systems. They also produce thick slime, usually coloured black. The odors produced by sulfur bacteria can be described as ‘rotten eggs’. Testing results for sulfur bacteria are reported as number of colony forming units per milliliter (CFU/ml) of water. For sampling equipment and information, please contact us. The basic test for Legionella is presence/absence. Identification of species of Legionella is also provided if requested. Bacteria testing under a phase contrast microscope. Bacteria Enumeration: Many samples can be analyzed to determine the total number of colony forming units (cfus) per unit (either volume, area or weight). Gram Staining: We can stain and categorize bacterial cultures as Gram-positive or Gram-negative, and provide colony and cell morphology information. If you have a question about Mold & Bacteria Labs testing protocol or a question about any mold/bacteria and their health effects, please email us or fill out our Question Form and submit for priority attention. Your questions will be answered within 48-72 hours. For immediate assistance call 905-290-9101.